[SatNews] In a week, the blaze grew to become the largest Sweden has seen in four decades. Cool and relatively moist, Swedish summers aren’t known for promoting wildfire. Fires occur in most years, but not on the scale or intensity of the blaze that raged through boreal forests in August 2014. It’s not clear how it got started, but fast-growing fire has consumed Västmanland since July 31. In a week, the blaze grew to become the largest Sweden has seen in four decades. As of August 8, it had charred more than 150 square kilometers (60 square miles), killed one person, and forced thousands to evacuate their homes. 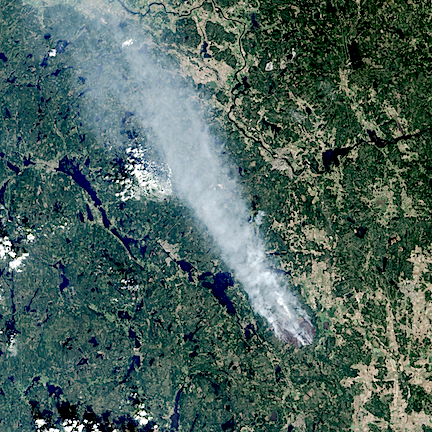 The Operational Land Imager (OLI) on Landsat 8 captured this natural-color image of the fire on August 4, 2014. Multiple smoke plumes rise from the perimeter of the fire and blow northwest in the wind. Burned forest appears brown; unaffected forests are dark green; farmland is light green; and fallow fields are tan. Hot and dry weather exacerbated the fire, stressing vegetation and priming it to burn. With a high-pressure system parked over Scandinavia, oppressive heat emerged across Sweden in July and August, bringing record or near-record temperatures to many towns and cities. In Sala, a city close to the fire, temperatures soared to 34.7 degrees C (94.5 degrees F) on August 5. Average temperatures are about 70 degrees F (21 degrees C) in early August. Wildfires aren’t common or widespread in Sweden. According to a report published by the International Forest Fire News, only a few hundred hectares (100 hectares is equivalent to 1 square kilometer) generally burn during the nation’s wet summers, and a few thousand hectares burn during dry summers. That’s less than 0.02 percent of Sweden’s overall forest cover. Find this article and others here. Alaska Dispatch News (2014, August 4) Forest fire rages on in central Sweden. Accessed August 8, 2014. AccuWeather (2014, August 4) Largest Wildfire in Over 40 Years Out of Control in Sweden. Accessed August 8, 2014. Aljazeera (2014, August 8) Sweden battles to control huge wildfire. Accessed August 8, 2014. NASA Earth Observatory (2014, August 8) Unusual July Temperatures. Accessed August 8, 2014.
International Forest Fire News (2004, June) Fire in Sweden—History, Research, Prescribed Burning and Forest Certification. Accessed August 8, 2014. Oman Observer (2014, August 8) France, Italy planes help battle Sweden’s massive forest fire. Accessed August 8, 2014.